Busy holidays mean a few updates get postponed, you know how it goes. Still, here’s a few Frostgrave bits and pieces that were finished some weeks back. More to come soon! Official model by North Star. 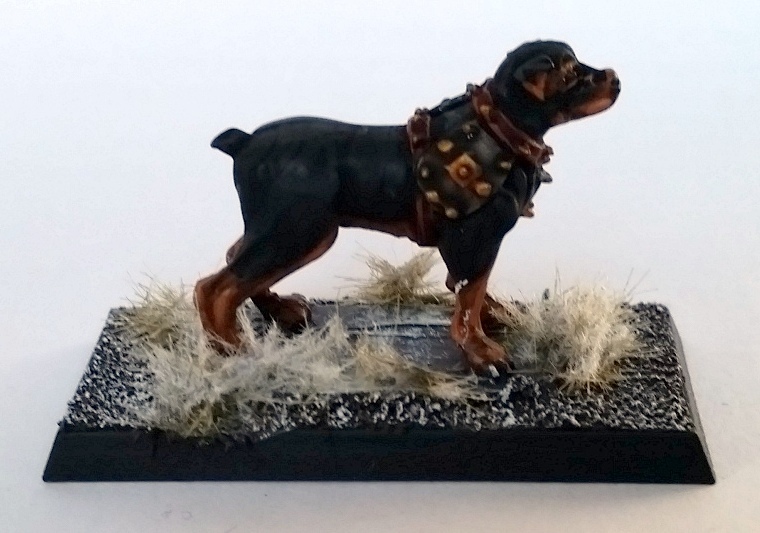 When I wrote up my starter warband roster for Frostgrave I always came up with 10 points to spend, and warhounds are the only option in such a case. What’s more, they’re fast and not much less fighty than your average thug or thief. These official models for Frostgrave are definitely on the expensive side, but in this case I couldn’t resist. Quite a bit bigger than your average dog, this one has obviously been bred to survive on the streets of Felstad. 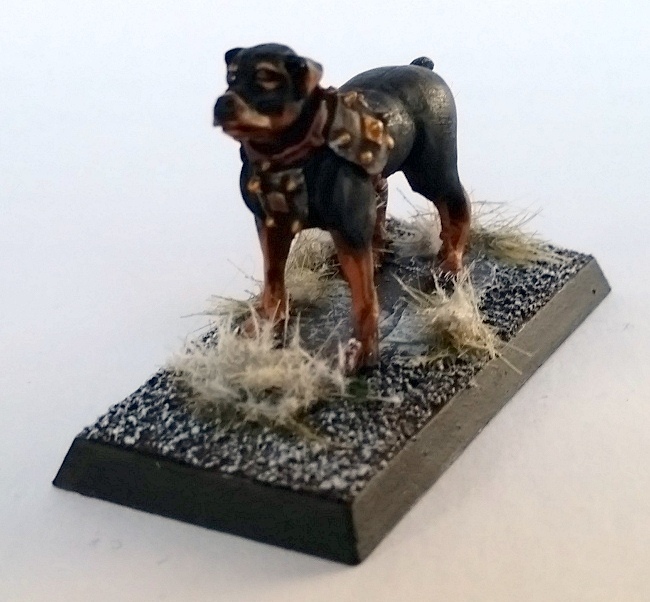 I painted the model more or less identically to the ‘official’ paintjob; being a cat person, I have but the vaguest idea of how a dog’s supposed to look. All in all I’m rather satisfied with how he came out, and he’s already gobbled up some thugs in my most recent games. Good boy! 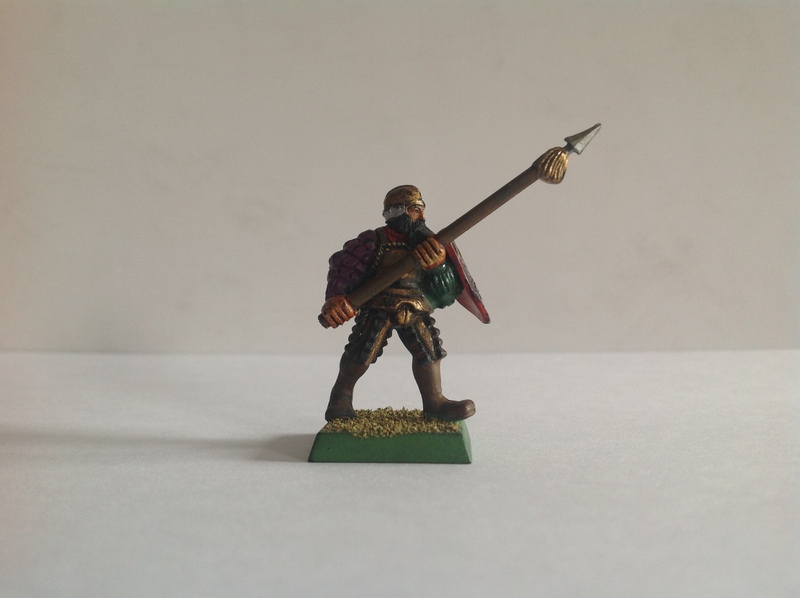 An old plastic Empire Swordsman. 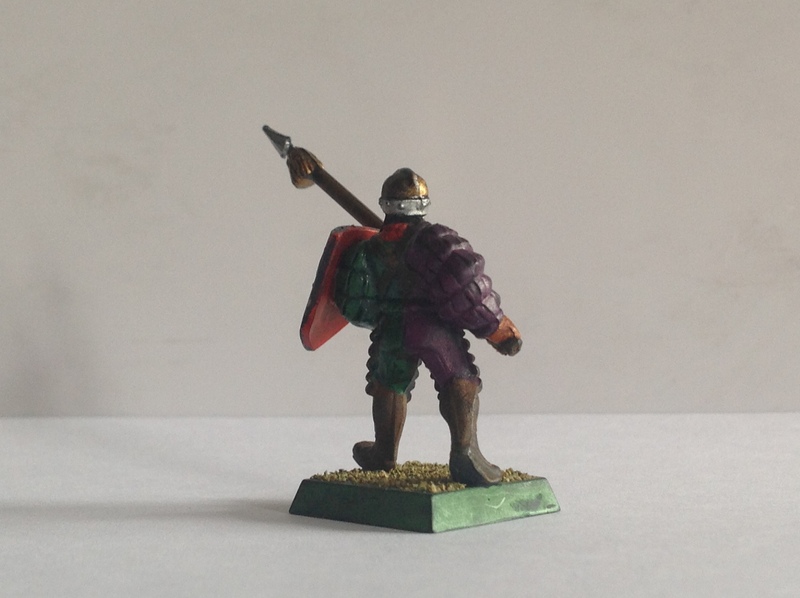 Then there’s this chap – I found him back in my rearmost bits boxes. I’d provided him with a paintjob that had over the years become somewhat dated, to put it very mildly, and I’ve updated him with new lick of paint. It’s become a fairly thick layer with all the different coats I’ve applied to him, but I like how he came out. Classic GW plastics: just the right amount of detail for rank and file. I’ve added a few things of my own, such as to provide a bit of woodgrain effect to the otherwise completely flat back of the shield. It’s a simple but effective model and generic enough to go with plenty of different warband styles I have planned out. That’s it for now. I probably won’t be covering Frostgrave this year anymore, but it’s one of the games I foresee to be playing a lot in 2016, so stay tuned! It’s Wednesday again, and that means I owe you another look at one of my old models or paintjobs. Last weekend my girlfriend left her camera unattended so I took it to my local game store (Het Spelplezier in Halle) where some of my older army projects are gracing the display shelves. I didn’t get a whole lot of time to photograph my models nor were the lighting conditions optimal, but otherwise the results are decent. 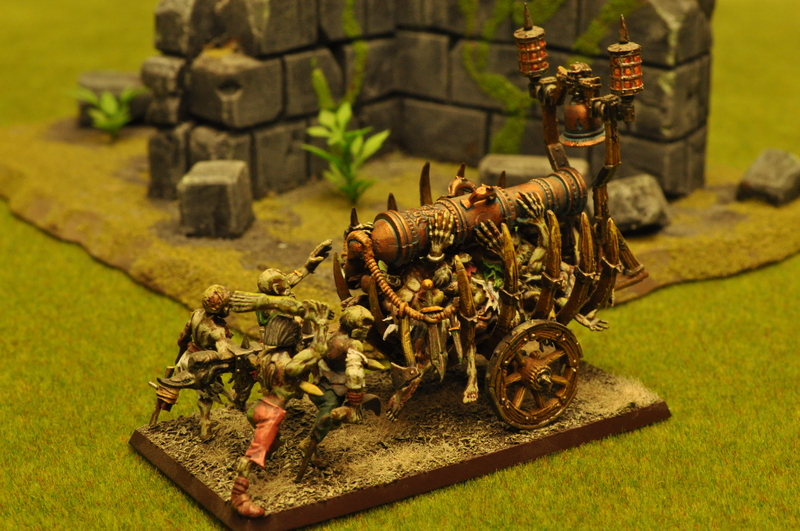 Mostly a Vampire Counts Corpse Cart with a Great Cannon barrel on top. As Games Workshop has become hideously expensive over the years, I started with this project for the simple reason of being able to play the same collection of models with two different armybooks – Empire and Vampire Counts. The basic infantry was simple enough to figure out; there was a hobbyist featured in the 6th edition Vampire Counts armybook who had done the same. What needed more pondering were the warmachines. Least plausible model ever – just one shot from that cannon and it’s curtains. 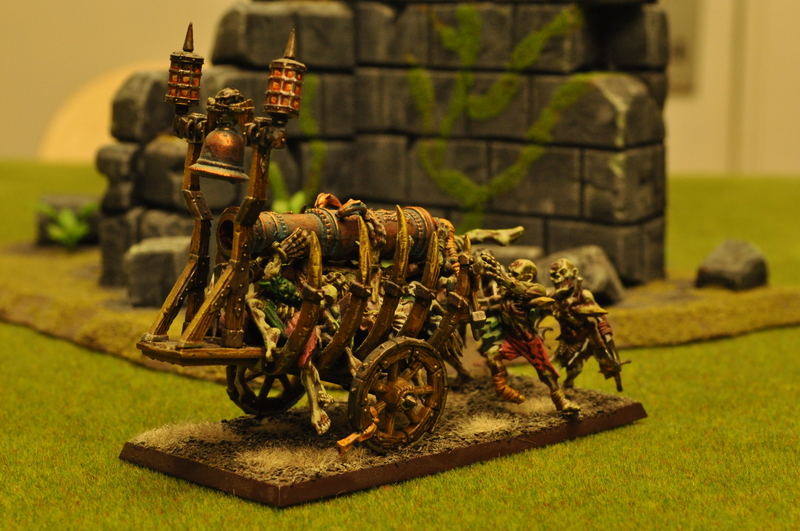 What I did was to flip the Corpse Cart structure around so that the zombies would be pushing it instead of pulling. 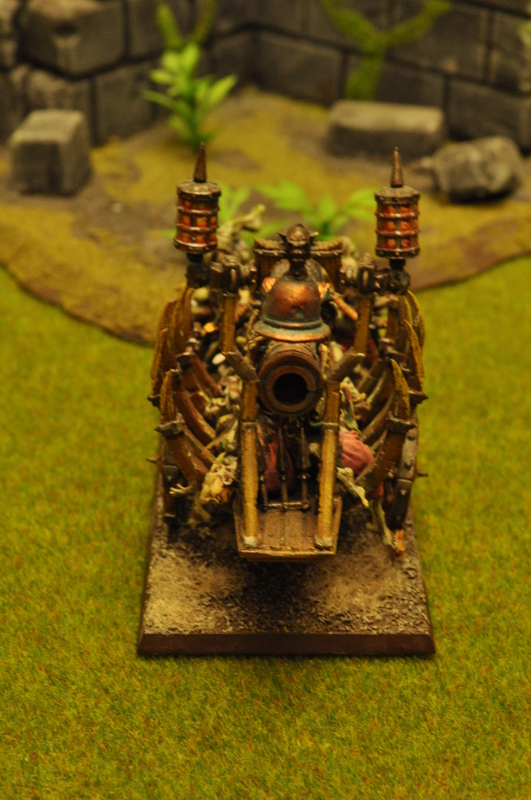 I cut a ‘gulley’ in the pile of corpses so as to make the cannon fit rather snugly, then added more arms from the Zombie kit to the corpse pile which would hold the barrel in place (yeah right!). The structure with the lanterns and bell was glued on backwards as well. The painting techniques I used on this model – and project, really – were already decided before GW switched from selling inks to washes, so I used plenty of drybrushing on this. For example, all that zombie flesh was basecoated bestial brown then drybrushed with rotting flesh, before receiving a yellow ink wash. It’s not the kind of way I’m painting these days anymore, but if I ever continue work on this project I’ll have some adapting to do. This is a model I painted in 2006 or 2007, I can’t remember exactly. There you – a look at a project I had never show you before. As always, there is more stuff coming up, but it’s been delayed somewhat as my health hasn’t been that good lately. Still, soldier on we must! Time for another blog update on a Yesteryear Wednesday! This time I’ll take you back nearly twelve years in the past, to one of my first models ever. A note to sensitive readers: it’s so bad you might cry. I certainly did. Twelve years ago, I passed by the GW store in Brussels, right after my exams in June 2001. 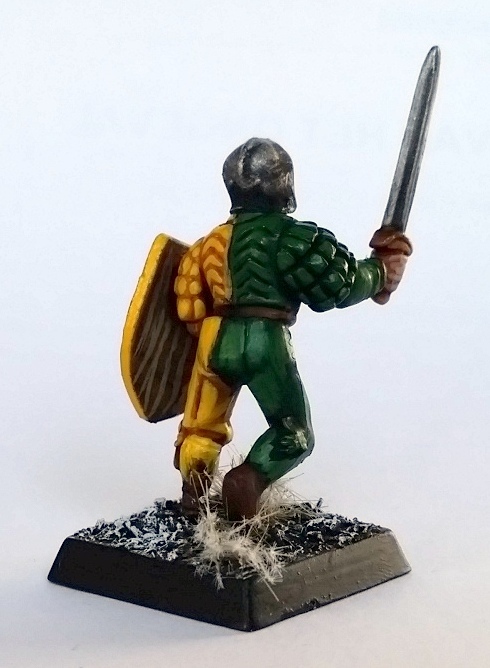 There were some well-painted models in the store display, and I thought to myself “hey, I could do that too!” The result, of course, being the horrid spearman on display today. I bought the boxed set of the game (the 6th edition one with Empire versus Orcs) and the basic paint set (with those screw-top pots that dried out after one use) plus a couple of extra paints such as liche purple, shining gold and black ink, the results of which you can see above. 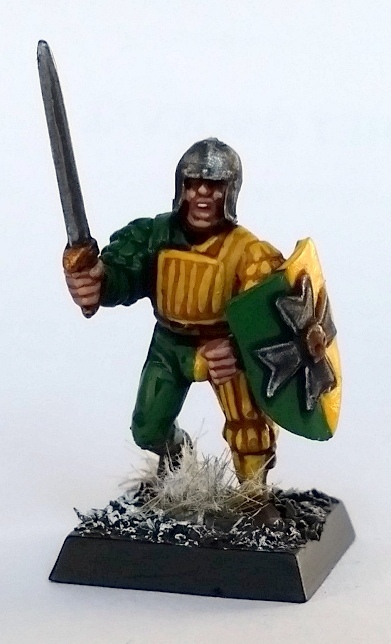 Probably my first conversion too, as the shield was pilfered from a Bretonnian Knight. My reasoning was that a wash of black over the entire model would make sense, which it obviously did not. 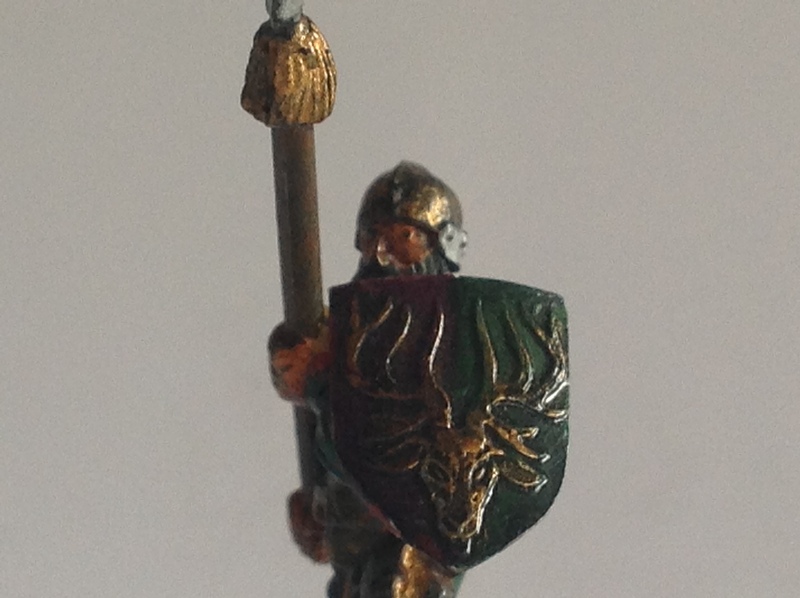 On this guy, I somewhat corrected the mistake by washing the skin with flesh wash instead, but the rest of the model is turned immensely dark and shiny by the dubious effects of the old GW black ink applied heavily and undiluted. Beyond that, my choice of colour scheme was also terrible. Purple and green on an Empire state trooper, what was I thinking! As you can see, I also didn’t understand the 16th century type uniform at all either – why does he have a golden codpiece? Why are his leggings golden? Those aren’t knee-high boots! The main reason for the gold is that he was the champion of the unit and my teenage self had apparently felt the urge to denote this low-ranking sergeant by covering him in bling bling from head to toe. Shizzle. But still, I can’t but feel nostalgia. Those were the days right after having wasted an entire year of my life on Diablo 2, and I was glad to have found a hobby that snatched me away from the computer screen. I saved up my paltry pocket money and went to the GW store in Brussels every Saturday afternoon where I tried my best at being taught painting skills by a unique french-speaking store staff (I’m dutch-speaking in case you were wondering) and from where I returned with a new blister and a paint pot or two. Those times are long gone along with the rest of my youth, but digging up a wayward test model from that bygone era, and one with such an abominable paintjob at that, does open the floodgates to a lot of beard-rubbing and moody humming. And waxing poetic about it, too. Still, if that doesn’t immediately correspond with your own experiences, I hope this post will also be of aid to readers who are fairly new to the hobby and are let down by the quality of their first paintjobs. Don’t give up – it took me twelve years to reach the level of my recent efforts, and your first paintjob can’t possibly be worse than mine! The tools of the trade have advanced immensely in recent years, with woodstain dips, high-pigmentation paints and washes making life a lot easier for aspiring painters than back in the day. As for my next post? Probably this weekend! I’ve been a busy bee these last two days and have made massive headway on completing the last 18 vikings for my starter army for Hail Caesar, and they should all be fully finished by Friday evening. The Anglo-Saxon player (Christian dogs! Cowardly turd-eaters! Worthless, beardless earslings!) has agreed to do battle with my Vikings (Shining sons of Odin! Brave axe-bitten fighters! Glorious silver-ringed seafarers!) next Thursday, and so they need to look their best. Haldebra, hai hai!